I love soup. 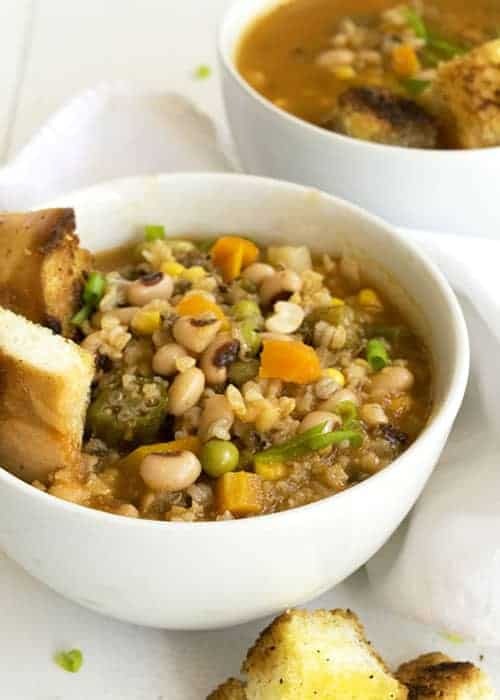 This black eyed pea and wild rice soup is super fast to make, and it’s healthy and vegan. Usually I get home from work super late (like midnight). I am STARVING, and I want something fast and healthy to eat. 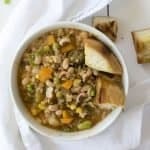 On this particular night, I raided my pantry and freezer and threw this soup together in 30 minutes! I made giant croutons for it too. You just tossed some bread in olive oil, and brown it in a pan. I think I have had a can of black eyed peas in my pantry for like two years. I bought them for a New Years recipe (that I never made), and I just forgot about them. But now they are making their debut! 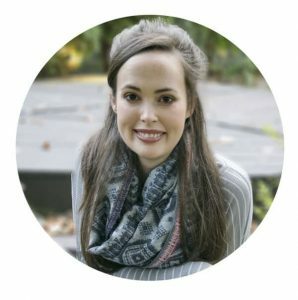 I started with some wild rice I found in the back of my pantry (again who knows how long I’ve had it, but that’s the great thing about pantry items!). I toasted the rice in a pot with some olive oil. 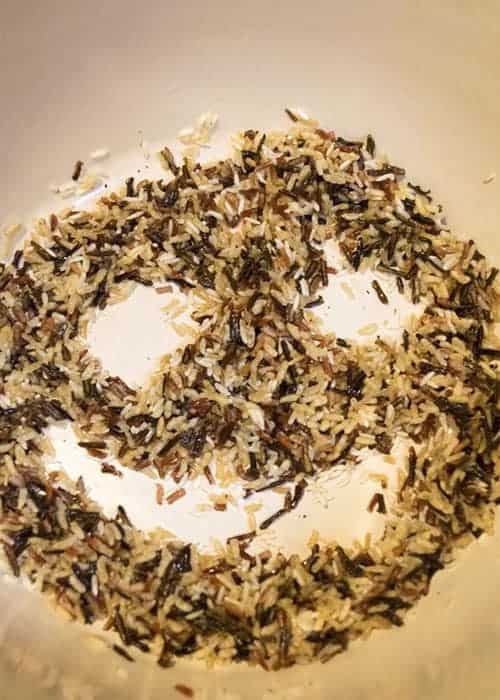 It’s happy rice! Then add some tomato paste, garlic powder, salt, and pepper. Stir for a minute or so. Then dump in about 3 cups of broth, a bag of frozen vegetables, and black eyed peas. Bring the soup to a boil, and then reduce it to a simmer and cover for 20-30 minutes! Then scarf it down and pass out (like me). 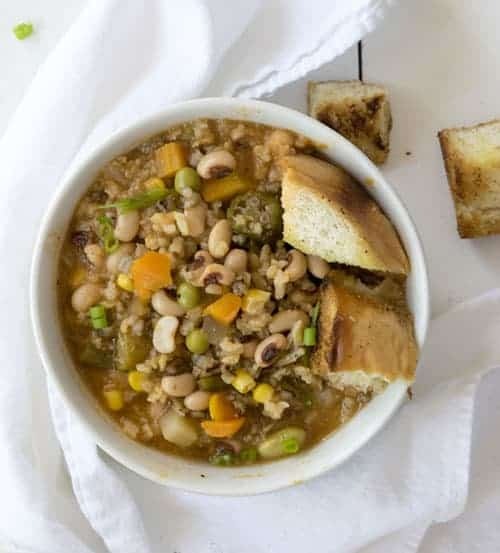 This soup take is a fast and easy recipe, and it’s vegan! Heat up the olive oil in a large pot over medium high heat. Then add the rice, and toast for 2-3 minutes. Toss in the tomato paste, garlic powder, salt and pepper. Stir until mixed into the rice. 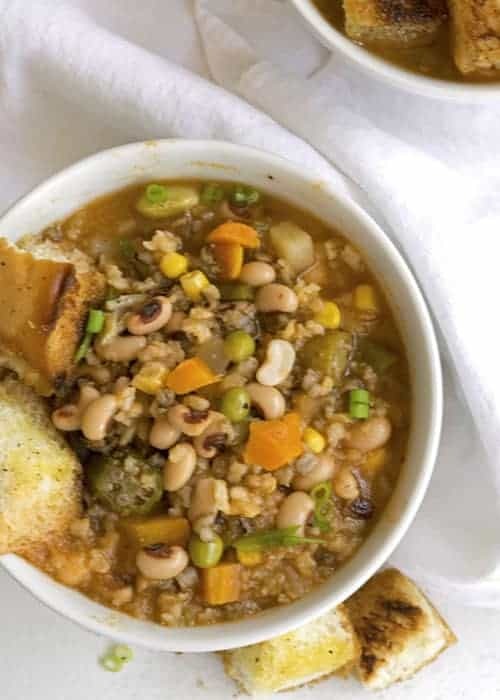 Add the broth, vegetables, and black eyed peas to the pot, and turn the heat up to bring the soup to a boil. Once boiling, reduce the heat to medium-low and cover the pot with a lid. Let simmer for 20-30 minutes.